Supplemental Figure S4. Recombinant GST-LesaDOG1 fusion protein expression and purification. A, Coomassie stained SDS-PAGE gel showing the IPTG induced expression of the 61 kDa GST-LesaDOG1 fusion protein (arrow) in E. coli. Samples of the growing bacterial culture were taken at indicated timepoints, heated in SDS-loading buffer and directly used in SDS-PAGE. B, Coomassie stained SDS-PAGE gel showing successive fractions of second round of protein purification process (see methods for details). 14) matrix bound protein after washes. Note: a large amount of GSTLesaDOG1 binds to matrix (2) whilst a small amount is not bound (3) and subsequently washed away (4-7); the matrix bound GST-LesaDOG1 (8) is efficiently proteolytically cleaved at its TEV recognition site resulting in LesaDOG1* appearing at ca. 37 kD and GST* at 25 kD (compare Supplemental Fig. S3) only leaving a small amount of uncut GSTLesaDOG1 (9); relatively pure LesaDOG1* is present in the unbound fractions (10-13) while GST* remains bound to the membrane (14); Fraction 10 was used in western experiments in Figs. 6 and 7 as a control and is referred to as 'DOG1'. 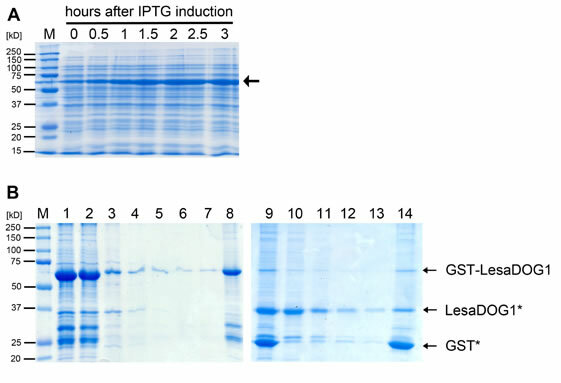 Note the remaining presence of GSTLesaDOG1 and free GST* as detected by anti-GST antibody (Fig.6C) in fraction 10, which is hardly visible in the Coomassie stain. M, molecular mass marker.